Continue trading for 30 days. Keep their highly ranked listings. Relist their old stock on their highly ranked listings under a new company. We have seen a copy of the notice Amazon are sending to VAT Evading Sellers. Amazon sends the notice once they receive a liability notice from HMRC. 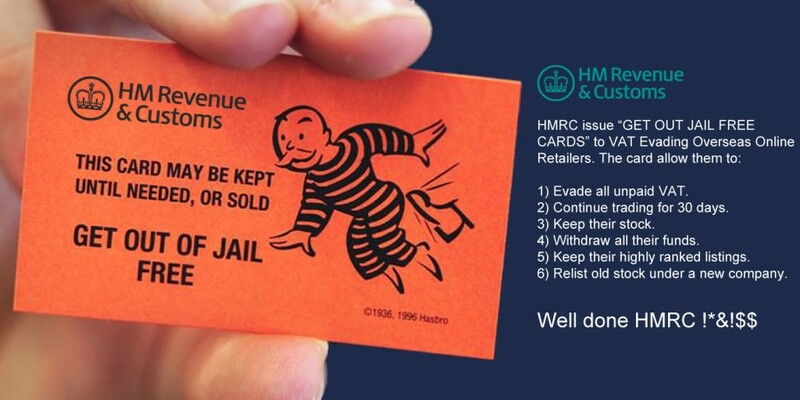 It is completely beyond belief that HMRC are not seizing stock, freezing assets and permanently removing the sellers listing from the Amazon catalogue. Doesn’t HMRC realise that these sellers will simply remove their stock, setup a new company and send the stock back into Amazon and sell it on their old highly ranked listings. And avoid paying any of the unpaid VAT from their old company. What is sort of deterrent is this? What on earth is going through HMRC’s mind!!? We can’t believe the complete incompetence that HMRC are still showing in tackling online VAT Fraud. It makes our blood boil. We received a notice from the UK tax authority, Her Majesty’s Revenue and Customs (HMRC), indicating that you do not currently meet VAT requirements in the UK. Sellers on Amazon must comply with all applicable laws and regulations. As a result, you may no longer sell on Amazon.co.uk and you are no longer allowed to use our Fulfilment by Amazon (FBA) service in connection with Amazon.co.uk. Please ship any open orders and submit a request to remove any FBA inventory from our fulfilment centers in the UK (https://sellercentral-europe.amazon.com/gp/help/200280650). If you do not submit this request within the next 30 days, we may dispose of your inventory. Additionally, you may no longer offer to ship items into the UK on any of Amazon’s European marketplaces. You may also no longer use our FBA service to ship items into the UK. Your shipping options have been restricted accordingly. If you have funds in your Selling on Amazon payment account, they will be available after any amounts for A-to-z claimsor chargebacks on your orders have been deducted. This usually takes about 90 days, but funds may be held longer by Amazon Payments Europe S.C.A. Please contact HMRC at onlineselling.compliance@hmrc.gsi.gov.uk to resolve your VAT status. Once HMRC informs us that their notice has been withdrawn, we may allow you to sell on Amazon.co.uk again. Please let us know when you resolved your VAT status with HMRC by emailing vatsubmit@amazon.com. To learn more about UK VAT obligations for overseas sellers, visit the UK Government website (https://www.gov.uk/guidance/vat-overseas-businesses-using-an-online-marketplace-to-sell-goods-in-the-uk#overseas-seller). For information on tax advisory firms with discounted rates for Amazon sellers, visit our VAT Resources help page (https://services.amazon.co.uk/services/fulfilment-by-amazon/vat-resources.html). This entry was posted in Latest News on 12th April 2017 by vatfraud.